Koios Beverage Corp. (OTC: KBEVF) (CSE: KBEV) today unveiled the Company’s plans to market its line of cannabis and CBD-infused beverages through an innovative distribution model, generally known as Direct Store Delivery (DSD) and Direct to Customer (D2C) sales. Cannabis beverages are produced and distributed through the Company’s wholly owned subsidiary, Cannavated Beverage Corp. in partnership with Keef Brands. Direct Store Delivery involves selling and shipping directly to retail stores that carry Koios products, with no use of any independent third party – neither an independent wholesaler, nor the retailer’s own warehouses. “We’re a company that thrives on innovation, and we’re not afraid to do things differently when it makes sense to do so,” said Koios CEO Chris Miller. “Building out distribution partnerships takes a lot of time and a lot of money, and adds additional cost to your products as you pay the middleman. 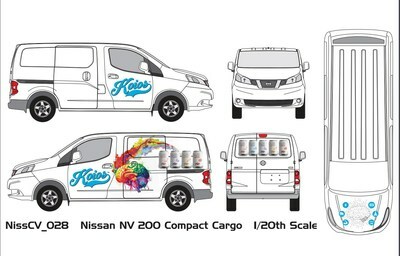 Koios has now purchased the first of what will be a fleet of branded delivery vans that will soon be seen travelling the streets and highways of Colorado. “Many of the other companies in this space don’t employ their own sales teams and rely instead on third parties,” Miller explains. “In our experience, this can hurt your brand in the early days as you hand over the important job of building relationships at all levels to someone else. Miller said Koios is also seeing growing success with its Direct to Consumer online sales, which doubled this month over last month. “We’re building relationships with our stores and our customers, and this process also allows us to cut our costs and pass those savings on to the consumer,” Miller said. The direct distribution model is particularly important, Miller explains, as Cannavated begins to distribute its CBD-infused or cannabis beverages. While cannabis is legal in Colorado and several other states, very few distributors are knowledgeable about cannabis and CBD beverages. The first Koios direct delivery van is already rolling on the streets of Denver today, Miller said, and the Company has also introduced an improved Direct to Customer experience on its online portal at koiosbeveragecorp.com . Definitely try CBD Beverages. It’s the only thing that’s helped my anxiety. If you can find a CBD beverage, that’s what works best for me.